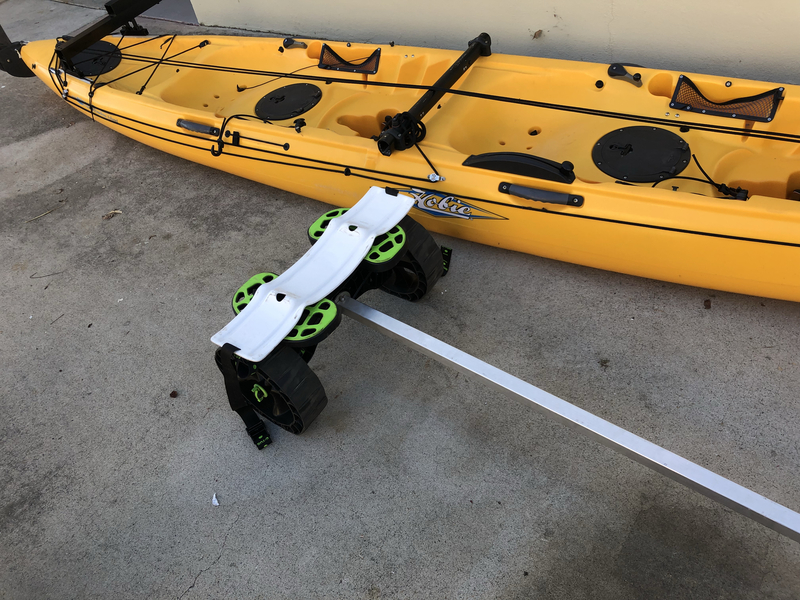 Hobie Forums • View topic - Making the C-Tug Cart TI friendly. 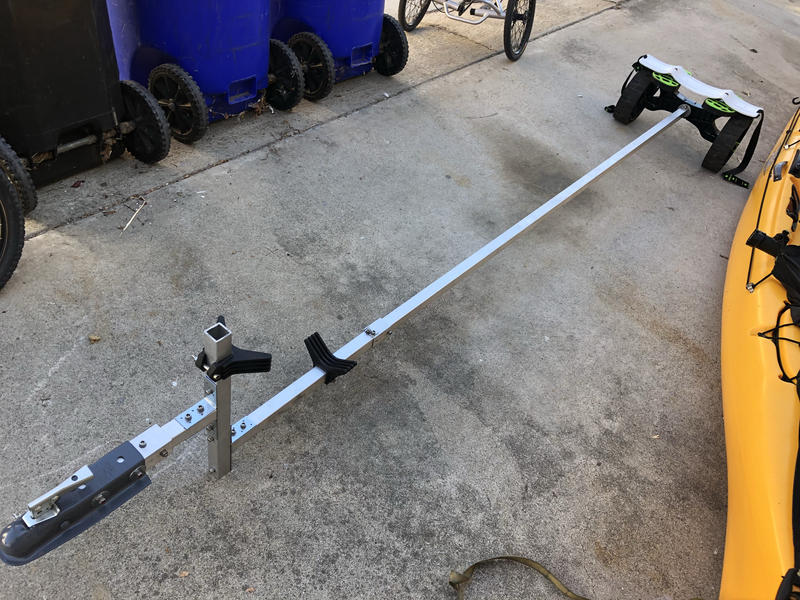 Post subject: Re: Making the C-Tug Cart TI friendly. I am thinking of getting two C-tugs to launch and store my TI. Strap one far forward and one far aft. No cradles. One just fore, and one just aft of the grooves in the bottom of the hull. Adjusting the pads to "V" shape if necessary. Hoping that won't WARP the hull bottom. My TI is kept just feet from the water in a compacted gravel lot. Just have to pull/push it over a small berm to the water which is protected and just inches to a knee deep. 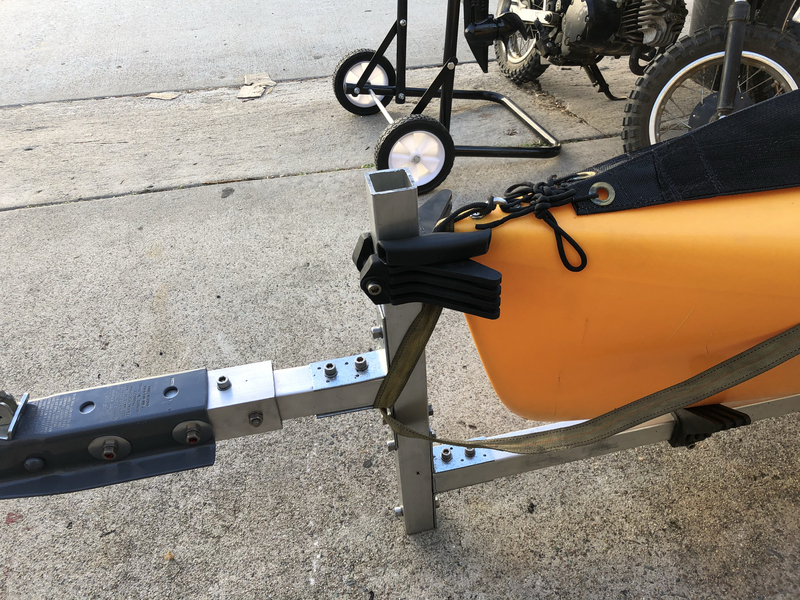 Ive been using a single hobie scupper cart with balloon wheels. 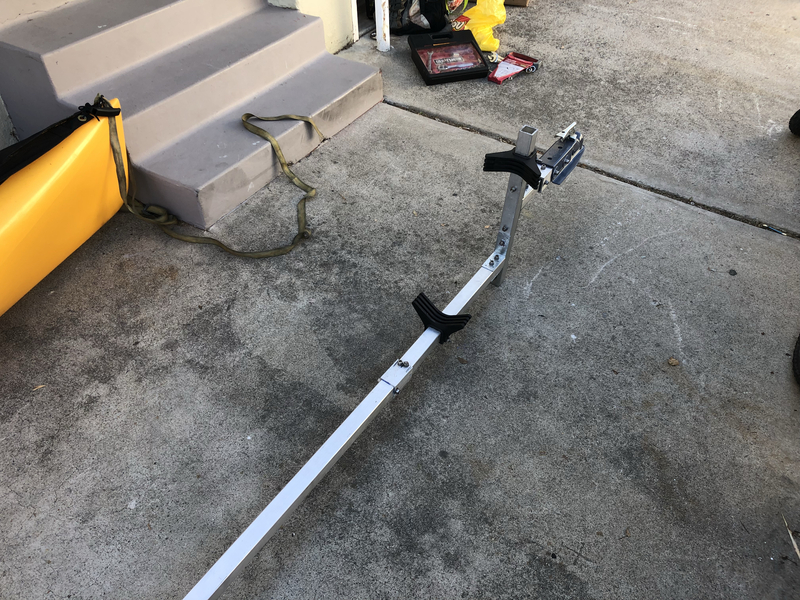 It's a pain turning over the TI to insert/remove the cart. I have to assemble the amas/akas in the water. Ever try tipping a TI on its side with amas attached? Not easing. Just want to store, launch. 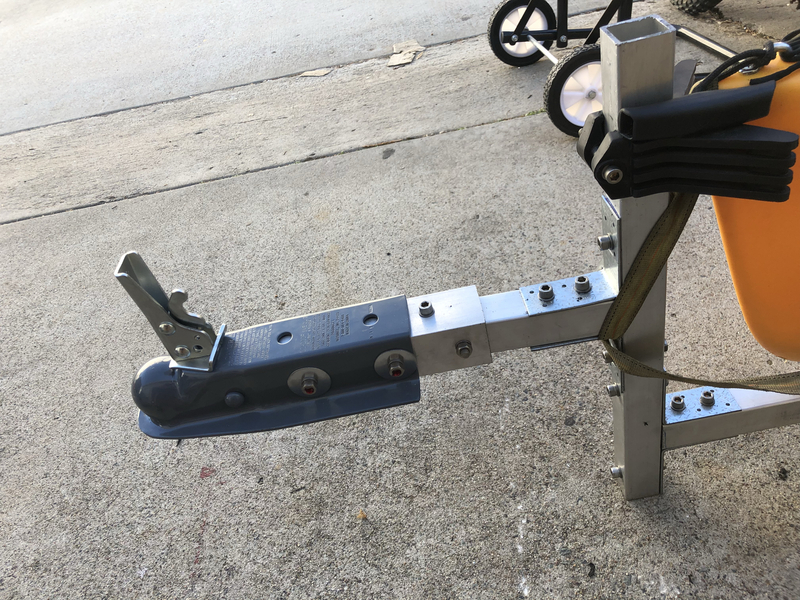 retrieve, store fulling assemble (less mast) TI. 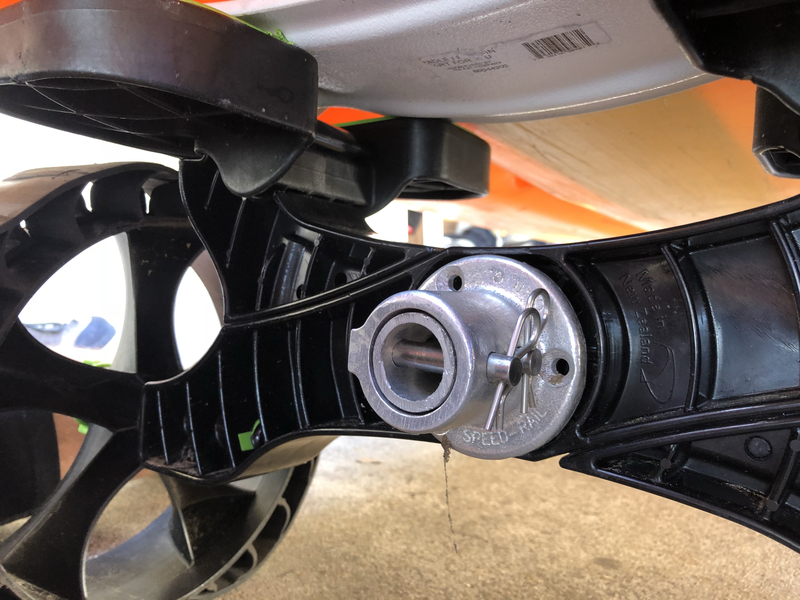 The flat pads on the C-tug will cause hull distortion, especially if you are permanently storing the TI on them. I wouldn't recommend it. Adding cradles helps and you could probably store a TI on two cradled C-tugs but you would need to add bow, stern and AMA supports. 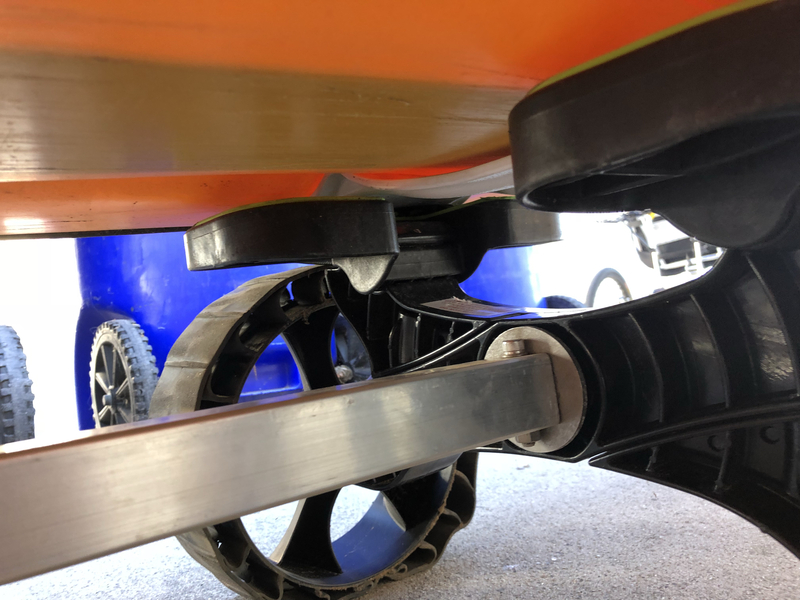 The trick with permanent storage on any cradle is even support over the entire hull length/width. 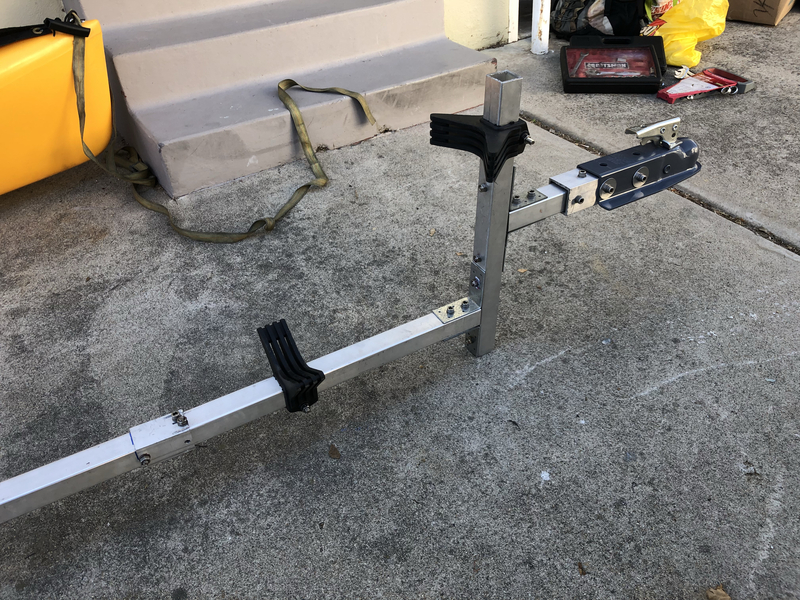 I've been storing the TI for two years now on two frames made of 2x4"s about 4 inches high with two long 8' PVC tubes along the grooves (as suggested by kayak bob). I place the frames just fore and aft of the mirage drive holes. No hull distortion. So I could probably just replace the wood frames with two C-tugs, keeping tubes underneath the hull. 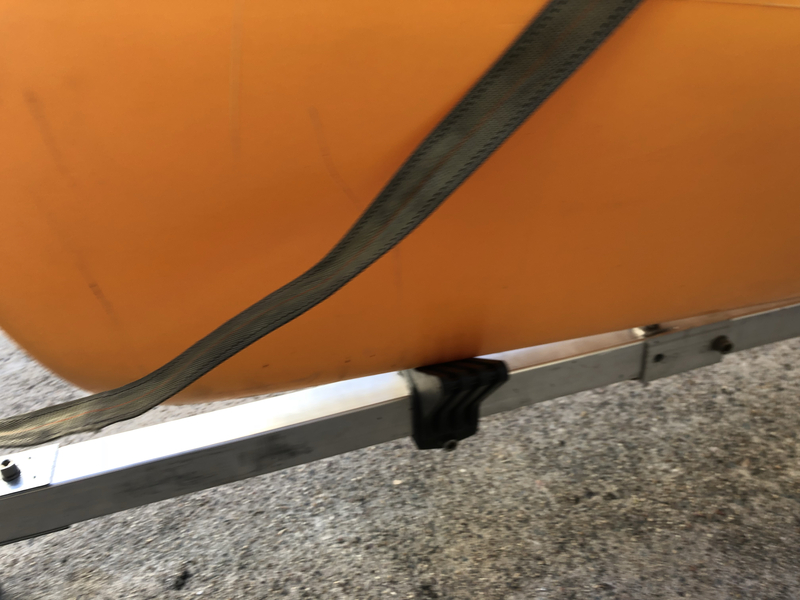 If you're willing to ignore the sticker on the cart that warns not to tow and only travel at walking speed, here's what I did. I travel a few hundred yards and drive on the beach. I also greased the plastic axles. 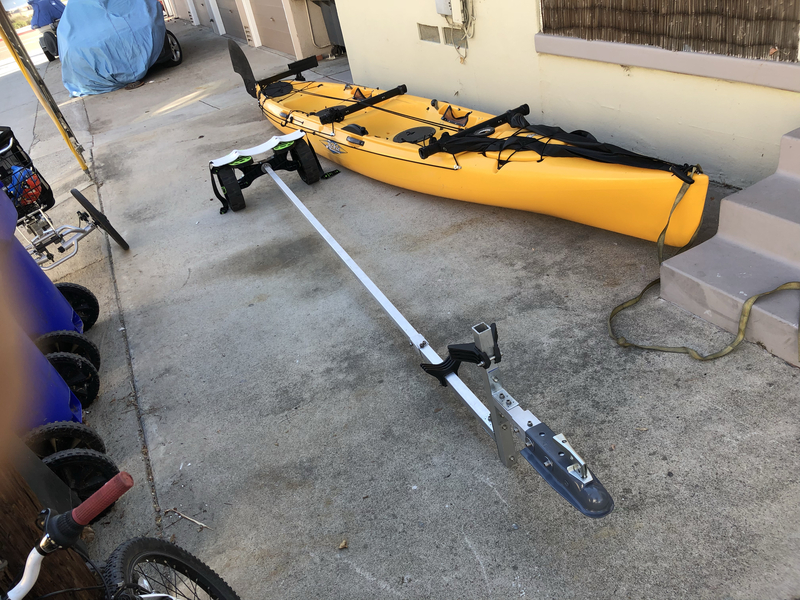 With the disconnect at the c-tug, I can disassemble this and store it in my vehicle while I'm on the water. Now that’s a use I bet C-Tug never envisaged! Very clever domer! 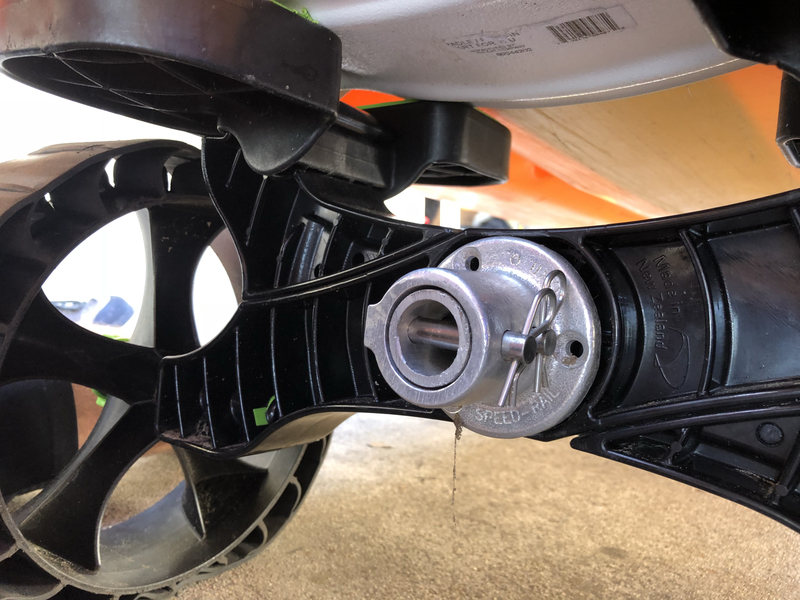 The one area of criticism I have with the C-Tug is with the plastic on plastic hub/axle. It should be a stainless sleeve on both as any sand in the hub does cause wear. 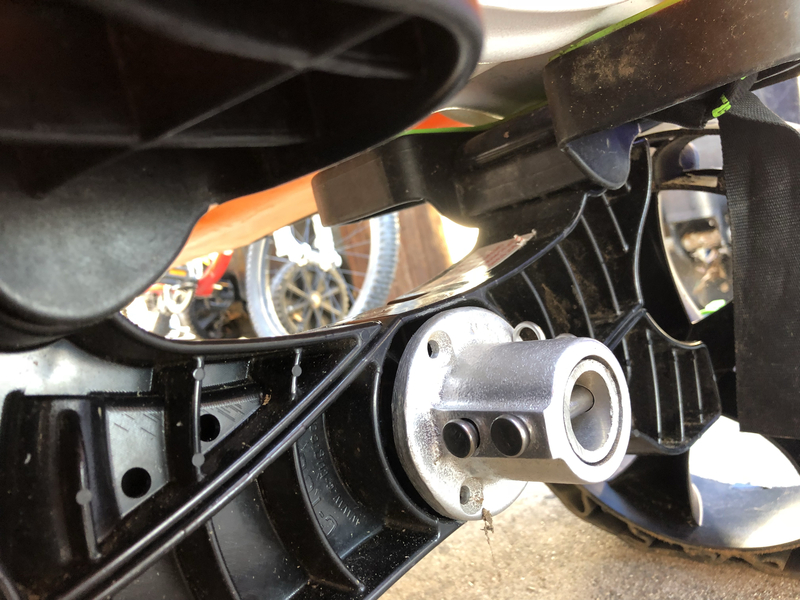 It’s a mod I’ve thought about but not acted on as I’m only wheeling short distances, but it would not be too difficult to sleeve both hub and axle if you find premature wear. Good idea about the sleeves, I might try that. 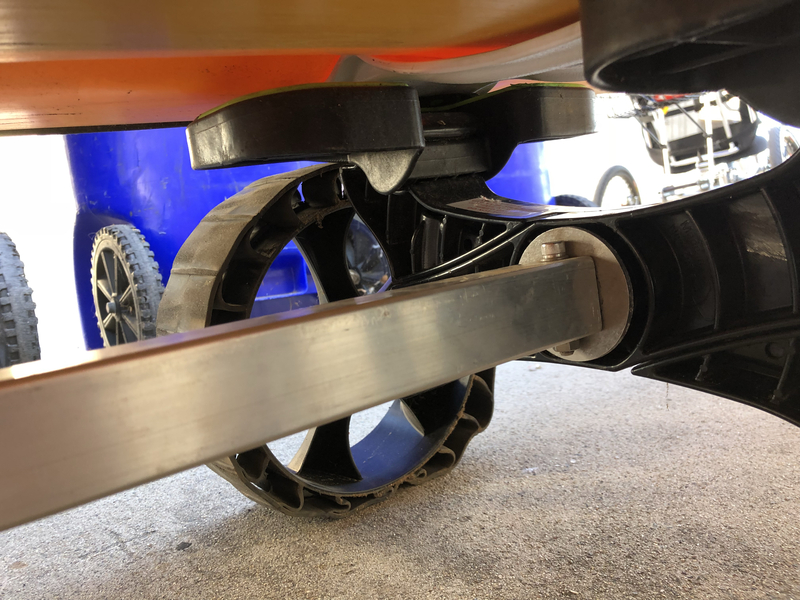 Thanks for your work on the C-Tug, I think it's a great cart.